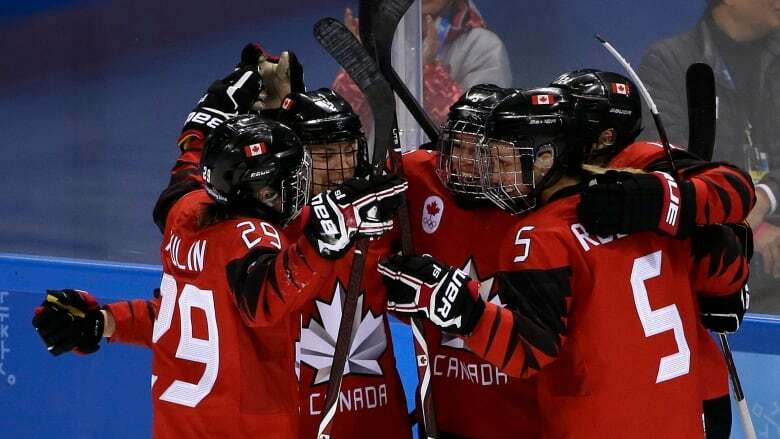 Rebecca Johnston and Mélodie Daoust each scored a pair of goals and Team Canada beat Olympic Athletes of Russia 5-0 in the preliminary round of the women's hockey tournament Sunday. The Canadians are at the Pyeongchang Games with a purpose and have even named their push to continue dominating women's hockey at the Olympics. They call it "Drive for Five," and Canada kicked off its bid for a fifth straight Olympic gold medal in smothering fashion. Canada broke open a scoreless game with three goals in the second period and shut out the Russians 5-0 Sunday night. Just don't call the shutout easy. "They had a lot of energy," Canadian forward Rebecca Johnston said. "I think they played well in the D zone and had really good sticks. We had to play a really good game to get those goals." Rebecca Johnston scored two goals and had an assist. Melodie Daoust had two goals, and Haley Irwin added a goal. Ann-Renee Desbiens made 18 saves. The Canadians dominated the Russians competing under the Olympic flag after the country was banned from the games for revelations of a massive doping operation. The International Olympic Committee cleared 168 competitors to take part as "Olympic Athletes from Russia," but this team was missing six players. "We put our trust in the IOC and WADA and making sure that it's an equal playing ground for everybody," Canada coach Laura Schuler said. "So it was great that they were still able to produce a team and was happy to see them be here." Fans brought in a handful of Russian flags in support of a team that ranked fourth in the world last year. Russian coach Alexei Chistyakov said through an interpreter the missing players didn't affect his team's mood, though they could've helped resist the Canadian onslaught after goalie Nedezdha Morozova stopped all 15 shots she faced in the first period. "It is very difficult to counter all 60 minutes such a big and powerful team," Chistyakov said. Johnston easily beat Morozova's glove at 1:55 of the second to open the scoring. Irwin redirected a long shot from Johnston at 4:13 for a power-play goal 9 seconds into the man advantage for a 2-0 lead, and the Canadians only cranked up their attack on the net. Captain Marie-Philip Poulin started the third goal with a pass as she was falling in the neutral zone to Meghan Agosta. She skated up the left boards holding the puck before sending a cross-ice pass to Daoust in front. Her shot banked off Morozova for a 3-0 lead at 15:58 of the second. Johnston scored her second at 8:41 of the third, sending a wrist shot whistling past the helmet of Morozova from a sharp angle for the power-play goal, and Daoust's second chased Morozova with 9:16 left after 38 shots.